The amount of equipment needed obviously depends on the scale of operations. For the home producer, many existing kitchen items can be used, but there are specialist suppliers who cater for both commercial producers and hobbyists. For commercial producers, floor-standing vats are available, with built-in heating and draining facilities. On a kitchen scale, a double boiler on the hob can be used. This is where a container of milk is placed in a water-bath so that water around the inner pan ensures that any temperature changes are gradual. This really is essential. You need to be able to notice even slight variations in temperature. There are floating thermometers, as well as those that attach via a bracket to the wall of the vat. Curd knives are available from suppliers but a long palette knife will do just as well if the scale of operations is small. This is a close-textured, muslin-type cloth for draining curds. It has a close weave ensuring that the fat particles are not lost. It is also used for lining moulds before curd is put in for pressing. An alternative name for a cheese mould is a form, and some people use this word to distinguish between the containers and the moulds that grow on some cheeses. Moulds are available in different shapes and sizes for soft and pressed cheeses, in stainless steel or high density food-grade plastic. Purpose-made plastic cheese mats are available. Trays are also necessary when whey is draining away from the cheeses. This is a must for making hard cheeses. There are several small presses on the market, as well as larger ones for commercial use. 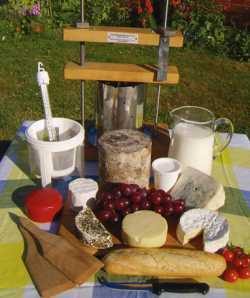 Many farmhouse cheeses are still being produced on presses that were used before the last war. Also necessary will be miscellaneous items such as measuring jugs, ladles, spoons, colanders, etc.